A place for Wiccans and Pagans to come together. Specialties: Within ancient Druidism, there were three specialties. "A general categorisation of the three different grades accords the arts to the bards, the skills of prophecy and divination to the Ovates and philosophical, teaching, counseling and judicial tasks to the Druid." 1 The Bards were "the keepers of tradition, of the memory of the tribe - they were the custodians of the sacredness of the Word." In Ireland, they trained for 12 years learning grammar, hundreds of stories, poems, philosophy, etc. The Ovates worked with the processes of death and regeneration. They were the native healers of the Celts. They specialized in divination, conversing with the ancestors, and prophesizing the future. The Druids and Druidesses formed the professional class in Celtic society. They performed the functions of modern day priests, teachers, ambassadors, astronomers, genealogists, philosophers, musicians, theologians, scientists, poets and judges. They underwent lengthy training: some sources say 20 years. Druids led all public rituals, which were normally held within fenced groves of sacred trees. In their role as priests, "they acted not as mediators between God and man, but as directors of ritual, as shamans guiding and containing the rites." Most leaders mentioned in the surviving records were male. It is not known whether female Druids were considered equal to their male counterparts, or whether they were restricted to special responsibilities. References to women exercising religious power might have been deleted from the record by Christian monks during the Celtic Christian era. Goddesses and Gods: The Celts did not form a single religious or political unity. They were organized into tribes spread across what is now several countries. As a result, of the 374 Celtic deities which have been found, over 300 occur only once in the archaeological record; they are believed to be local deities. There is some evidence that their main pantheon of Gods and Goddesses might have totaled about 3 dozen - perhaps precisely 33 (a frequently occurring magical number in Celtic literature). Some of the more famous are: Arawn, Brigid, Cernunnos, Cerridwen, Danu, Herne, Lugh, Morgan, Rhiannon and Taranis. 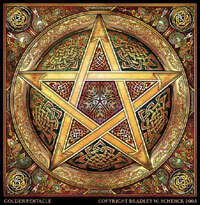 Many Celtic deities were worshipped in triune (triple aspect) form. Triple Goddesses were often sisters. Afterlife: They believed that the dead were transported to the Otherworld by the God Bile (AKA Bel, Belenus). Life continued in this location much as it had before death. The ancient Druids believed that the soul was immortal. After the person died in the Otherworld, their soul reincarnates and lives again in another living entity -- either in a plant or the body of a human or other animal. After a person has learned enough at this level, they move on after death to a higher realm, which has its own Otherworld. This continues until the individual reaches the highest realm, the "Source." A Druidic visitor to this web site wrote: "All things are created from the Source, including the Gods. We are just sparks from its flame." At every birth, the Celts mourned the death of a person in the Otherworld which made the new birth possible. Creation Myth: No Druidic creation story appears to have survived, although there are numerous accounts of the supernatural creation of islands, mountains, etc. Baptism: There is some evidence that the Celts had a baptism initiation ceremony similar to those found in Buddhist, Christian, Essene, Hindu, Islamic, and Jainist sacred texts. Other researchers dismiss baptism as a forgery by Christian scribes as they transferred Celtic material to written form. "Briefly stated the virtue of Honor requires one to adhere to their oaths and do the right thing, even if it will ultimately hurt others or oneself in the process. A Druid is obligated to remain true to friends, family and leaders thus exhibiting the virtue of Loyalty. Hospitality demands that a Druid be a good host when guests are under one's roof. Honesty insists that one tell the truth the whole truth and nothing but the truth to yourself, your gods and your people. Justice desires the Druid understands everyone has an inherent worth and that an assault to that worth demands recompense in one form or another. Courage for the Druid does not always wear a public face; it is standing-strong-in-the-face-of-adversity, alone or with companions. Sometimes Courage is getting up and going about a daily routine when pain has worn one down without complaint or demur.